It's been a while since I've complained about the name of a Trader Joe's product. But this one affords me a golden opportunity to do so. Not Trader Joe-San? Not Trader Ming? Perhaps the lack of an ethnic name stems from the fact that no single nationality lends itself to these crunchable little ricey puffs. 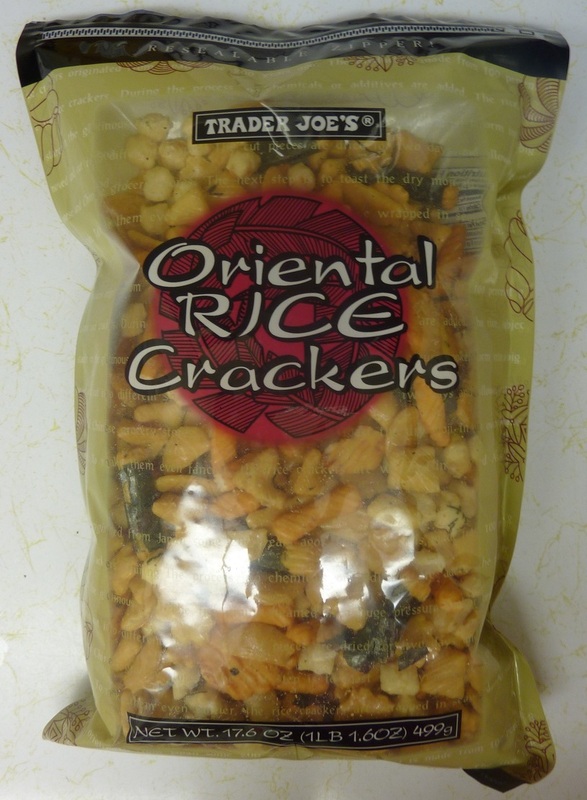 The good people at Trader Joe's, no doubt assuming that all Eastern peoples enjoy crisp ricey puff things, went with a name that suggested the entire continent of Asia. Not "Asian," of course, but "Oriental." I thought we had left that term behind in the 90's, but Trader Joe's has resurrected it successfully with these intriguing, snaxcellent morsels. Makes you wonder if TJ's will ever offer us a hot dog-ish meal or something entitled "Trader Joe's Occidental Meat Sticks." The Rice Crackers are ultra-crispy. They taste like rice. Which, to me, is good. I like rice-based foods that taste like rice—because I enjoy the taste of rice. And yet, it's not just the taste of rice in these snacks. There's some kind of toastiness. And some kind of moderate spiciness in certain ones. And my favorites are the ones wrapped in seaweed. Yep. 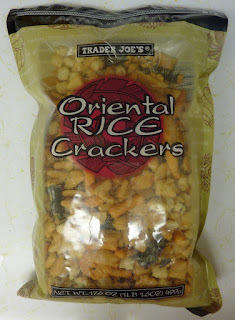 Some of these rice-snacks are wrapped in a bit of seaweed tasting very much like TJ's famous Seaweed Snacks. I'm not sure whether I like rice or seaweed better....hmmm....rice. No seaweed. No rice. I've just achieved the record for the greatest number of uses of the word "rice" in any What's Good at Trader Joe's paragraph ever. 10 times. Sonia, get Guinness on the phone! Anyhoo, they're good—if you like rice and seaweed. Highly snackable, fun little shapes. They have a unique, yet somehow strangely predictable taste. I knew what they would taste like before I put them in my mouth. Which makes me think I've eaten something similar in the past. But my mind is shot these days...and I can't quite put my finger on what it was. Sorry. Sonia says they remind her a bit of Corn Nuts. Maybe a little. That wasn't what I was thinking of. But I can see that. Sonia gives them 3.5 stars. I'll give 'em 4. Bottom line: 7.5 out of 10 stars. The word oriental is only offensive if used to describe a person. Food and rugs are still okay.